Alex Ovechkin scored his NHL-leading 49th goal of the season to snap a four-game drought and help Washington beat the Carolina Hurricanes 4-1 on Tuesday night, increasing the Capitals' division lead. Ovechkin snapped a shot past Petr Mrazek for the go-ahead goal 4:31 into the third period for his third goal in 10 games. 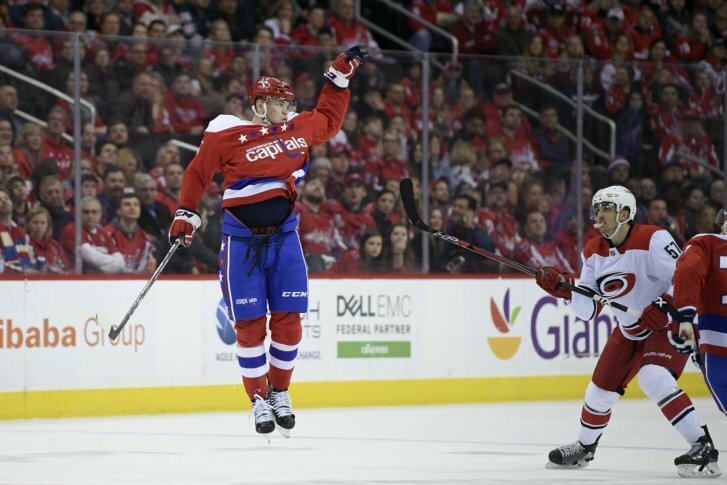 Fans chanted, “We want 50!” after Ovechkin’s goal was announced, but they’ll have to wait at least a couple of days for Washington’s captain to become the third player in league history with 50 in eight different seasons. Only Wayne Gretzky and Mike Bossy have done that. Mrazek, who once made 15 saves on Ovechkin in a single game, stopped him several times before the Russian star scored through a screen set by Evgeny Kuznetsov. With his 656th career goal, Ovechkin tied Brendan Shanahan for 13th on the all-time list. Kuznetsov also set up T.J. Oshie’s first-period goal and helped on John Carlson’s insurance goal in the third to give him three assists on his bobblehead night. Braden Holtby made 27 saves and Nicklas Backstrom added an empty-netter off a pass from Ovechkin to give the Capitals their second consecutive victory. Washington increased its lead to three points over former coach Barry Trotz and the New York Islanders atop the Metropolitan Division. But the Columbus Blue Jackets’ defeat of the Islanders on Tuesday night kept the Capitals from clinching a playoff berth. The result in Columbus hurt the Hurricanes, who are fighting with the Blue Jackets and Montreal Canadiens for the final two playoff spots in the Eastern Conference. Carolina was unable to keep pace in that race and had its two-game winning streak snapped despite a goal from Dougie Hamilton and 24 saves from Mrazek. NOTES: Oshie’s goal was his 23rd of the season. … Hamilton scored his second goal in four games. … Capitals D Michal Kempny missed his third consecutive game with a lower-body injury that could sideline him for the remainder of the season. … D Jonas Siegenthaler was a healthy scratch after being called up Monday. The Capitals open a three-game road trip when they visit the Hurricanes on Thursday in the second half of the teams’ home-and-home series.